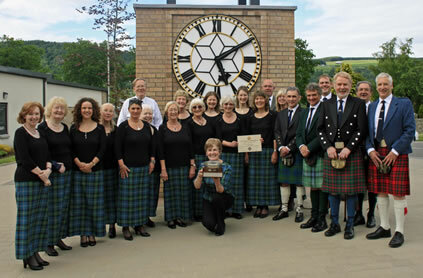 Aberfeldy and District Gaelic Choir took part in two competitions at the Perthshire and Angus Provincial Mod in Aberfeldy on Saturday 9 June 2012, winning the Puirt a Beul competition and finishing second in the Westcroft Trophy competition. Gaining the highest marks in both Gaelic and Music, the Choir lifted the May Mitchell & Frances Matheson Quaich for their singing of the mouth music ‘Seonaid NicGumaraid’. In the Westcroft Trophy, the Glasgow Islay Gaelic Choir took first place. Choirs from Aberdeen, Oban and Dundee also competed in the two competitions and many of the choirs enjoyed the Mod ceilidh at the Fountain Bar afterwards. The Choir hopes to repeat its successful performance at the Mull and Iona Mod in Tobermory, and the Royal National Mod in Dunoon, later this year.